So, when I crossed state lines to get wine (and alcohol) I made sure to make sure I loaded up my cart as I don’t know when I’ll be braving the traffic to head back to New Jersey. While it might not seem far away, with traffic the closest location to me that sells alcohol is an hour away. So, two trips and I don’t wish to disclose how much I spent, but I am glad that Trader Joe’s wine and liquor selection is reasonably priced. One of the items that grabbed my attention right away was their Secco collection. 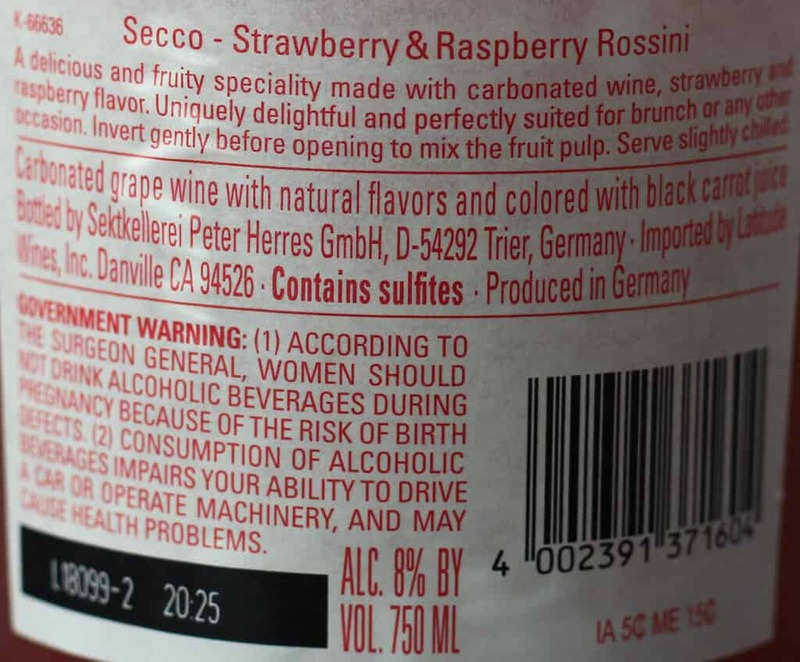 This is one of five Secco offerings available. 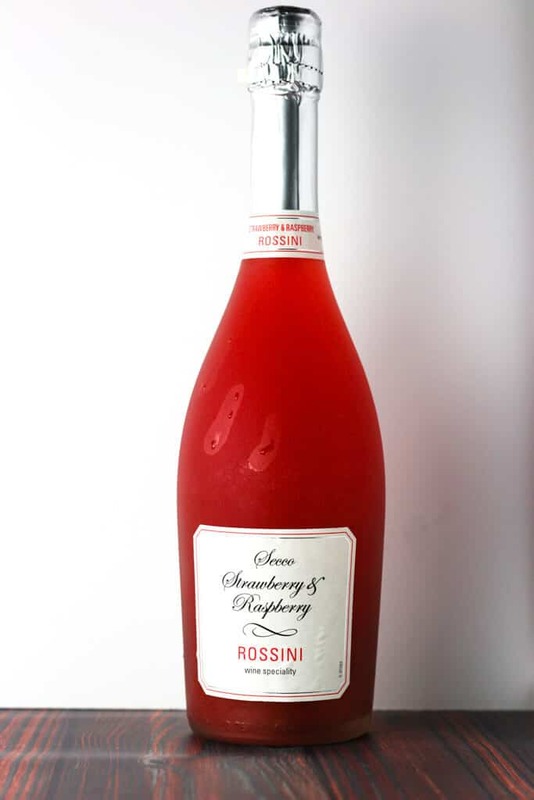 Other varieties include mango, peach, grapefruit, cranberry and this bottle of Strawberry Raspberry. And yes, I tried this one first because I thought it was the prettiest of the bunch. This bottle had me a bit confused. It unwrapped like a champagne bottle. The plastic cap was even shaped like it had that familiar metal mesh. But it was all plastic. All you need to do to open this is twist. I hope by writing this that saves someone some time and aggravation. Unlike a typical bottle of bubbly, there is no cork. It’s a screw top with a plastic cover. Perhaps its there to make sure that if you place this bottle on its side to chill, it won’t leak. Opening difficulties aside this particular flavor reminded me of what a strawberry daiquiri would taste like if it were made with wine. It’s fruitier than a wine cooler, but not quite as fruity as a freshly made daiquiri. Light, fizzy, fruity, sweet but not too sweet. The strawberry is the primary flavor but the tartness of the raspberries comes through. This isn’t a sophisticated bottle. It’s sweet, fruity, slightly effervescent. The bubbles will hold a few days because of the screw top assuming you don’t drink the whole thing. This is something worth breaking into for a picnic, sitting on a deck, having company, having appetizers or with dessert. 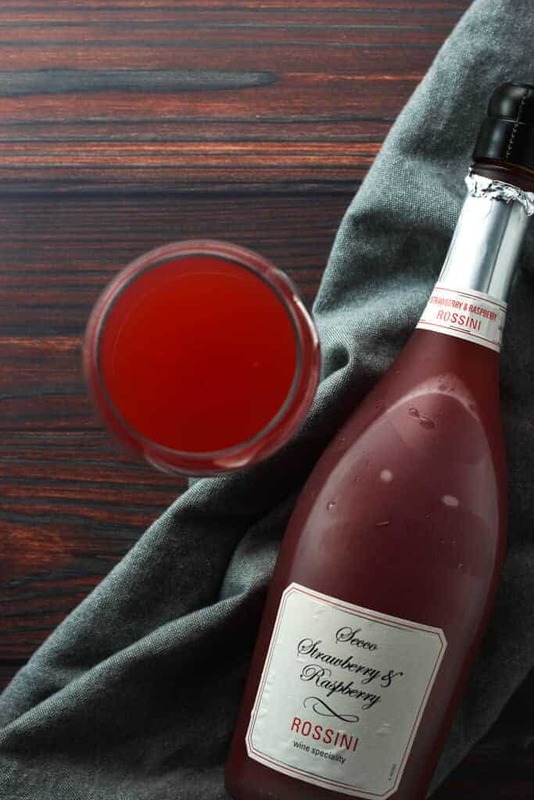 For $5.99 it’s nothing fancy, but if you already are a wine cooler fan or want something light, fruity and refreshing then this is a solid bottle to reach for. Would I buy this again? 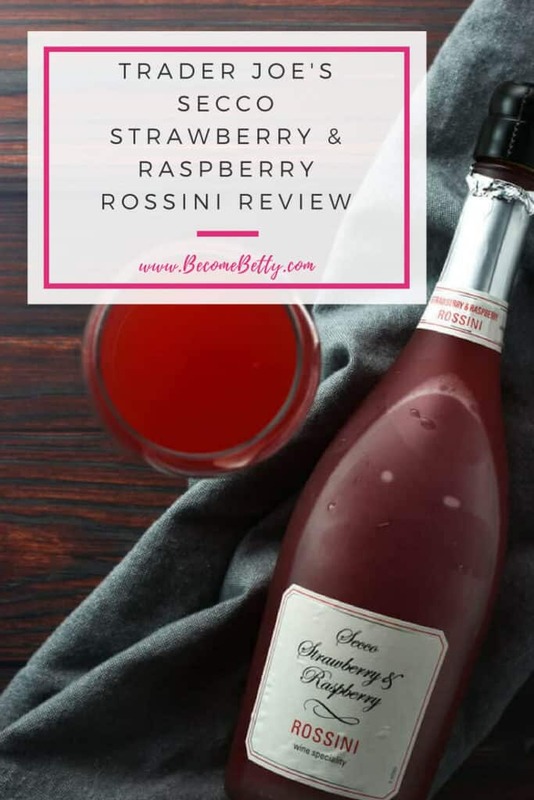 Yes, I’ll be picking up a few more of Trader Joe’s Secco Strawberry and Raspberry Rossini the next time I can get to a location that actually sells wine. Looks pretty but I am not a fan of sweet drinks. Hmmmm….maybe a little poured over some berries though? What got to me is where it is made! Trier, Germany! I have been to that town and when when I was there was not a large town. Hey Dag! That is so cool that you’ve been to the town where it is made. Do they make other wines there? Hey Dag! You think the way I do. I totally bought things that were “pretty” and all those Seccos were pretty. People were coming in and buying them by the case so I figured how bad could they really be? I got into the peach too and that was on par with a wine cooler. But for the price it’s cheaper than a wine cooler. Thanks so much for stopping by! I hope things are cooling off for you! I’m liking this Strawberry and Raspberry flavor. Can’t to try the other flavors. I love mango but didn’t grab it cuz it look like this flavor was very popular since there were only a few on the shelf. Hey Dee! I think that whole section full of colorful wines are really popular. They aren’t for wine snobs, but they are something to enjoy because they just taste good. Thanks so much for taking the time to stop by. Hey Cc! I picked up a bottle of that too. Glad to know its good! I loooove this wine! Addicted to it! Same. I just wish they sold it in all the stores. So few of Trader Joe’s stores carry wine. Thanks so much for stopping by! Omg thank you!! I was standing there looking at the cap for ten minutes trying to figure out what I should do and a quick google search lead me here! So thanks for that! I came here looking how to open the f’ing bottle. I tried last night. It has the look of some kind of perforated plastic, tried to cut through those, cut my finger instead. I haven’t opened the bottle, but there has been blood shed. I’m a pianist, not a good thing. Here I am the next night,found you. Opened the bottle. I will toast to you, and to my poor cut finger as well. Hey Julie! I’m glad I could help, albeit not in time to help you out. I hope the wine was good. If you ever have any questions about at TJs product, don’t be afraid to stop by and ask. I hope your finger has healed!